stock available for sale, lease or rent. We always have plenty of new and used shipping containers on hand for clients to view. Grab a coffee right now and spend some time looking at the biggest web based container sales portfolio in the world Greenfield Containers. Located at Shipping Containers House, Oakdene Farm, East Wellow, Romsey, S051 6BH. We are a locally owned company started 35 years ago that specialises in selling , converting, hiring and and leasing shipping containers. 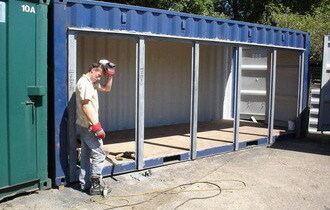 With over 35 years experience in the shipping container business, we have vast stocks of various sizes of containers. Owners John and Chris Greenfield offer a very welcoming facility and there is always hot coffee! We also have the ability to modify units by adding security doors, roof hatches, windows and our own high tech insulation for portable offices. We are the biggest UK manufacturer of shipping container lock boxes. We do every type on the market. We are proud to bring to you the "big picture" exactly what we have in the shipping container world. 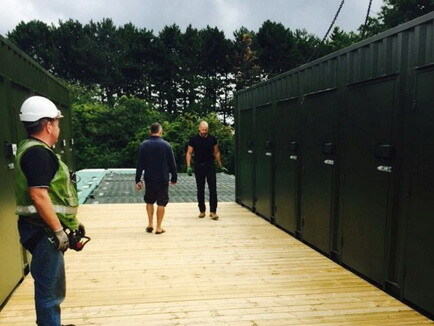 Customers are always welcomed and encouraged to drop into our yard a around the UK to look at shipping containers we have for sale. A cookie is a small data file which asks your permission to be placed on your computer's hard drive. Once you agree, the file is added and the cookie helps analyse web traffic or lets you know when you visit a particular site. Cookies allow web applications to respond to you as an individual. The web application can tailor its function to your requirement, preference on likes and dislikes by gathering and remembering information about your preferences. We use traffic log cookies to identify which pages are being used. This helps us analyse data about web page traffic and improve our website in order to adapt it to customer needs. We only use this information for development analysis purposes and then the data is removed from the system permanently. A cookie does not allow or give access to your computer and any information about you other than the data you choose to share with us. If you fill out online contact forms you have asked us to contact you accordingly. You have the option to choose or decline cookies through your browser a simple process. All web browsers automatically accept cookies, but you can manually block your browser setting to decline cookies if you prefer. This may prevent you from seeing some of the website although we endeavour to make our sites as user friendly at all times. Your privacy matters to us.